Many of our customers ask what is better, the QVR audience response app or audience response sets? In response to this common inquiry, I wanted to write a short blog comparing the two options. I would not say that one is better than the other--it simply comes down to how and where you plan on using your audience response system. There are a handful of advantages to using classroom response sets or individually purchased clickers. 1. No Wi-Fi or internet is required. Qwizdom clickers are all FCC certified, two-way RF technology, based on the 802.15.4 IEEE standard. All these fancy specs simply mean that our response systems offer a reliable, closed network that insures interference free connectivity. So if you are conducting a large event, we often recommend using the response clickers because sometimes Wi-Fi can be difficult for everyone to access at the same time. 2. When you purchase a response set you receive an instructor remote. The Q6i allows you to run an interactive presentation from anywhere. This means you can navigate between slides, pose questions and display polling results from anywhere in the room. This can be very helpful, if you are conducting a training and need to keep the presentation running smoothly while offering assistance to an individual. The instructor device allows you to easily move around the room without being tethered to your laptop or workstation. 3. There are no ongoing fees when you purchase a classroom set. Free software, updates and tech support are included with your purchase. In addition our hardware is incredibly durable. We offer a one-year warranty, but beyond that our sets have been known to last more than 7 years, with minimal replacements or firmware updates. 4. With a closed network, you can better guarantee that students are all on task. Classroom clickers minimizes web detractions and allow you to track participation. 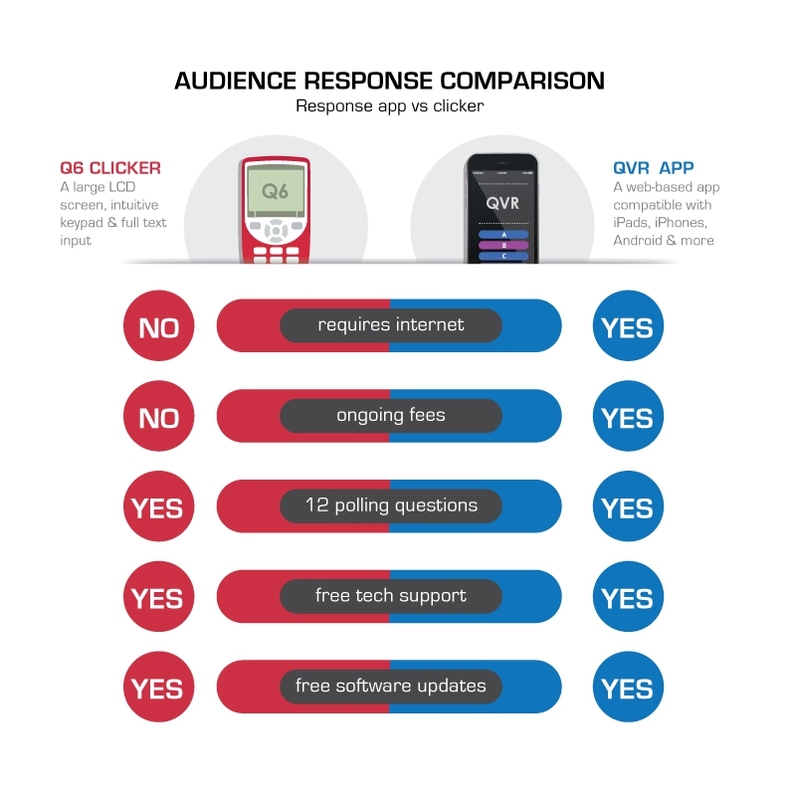 The QVR polling app is a low-cost solution that allows you to quickly poll your audience. The QVR app can be found on iTunes or Google Play or accessed through any browser. It is free for participants to download when you purchase a presenter license. The app is often a good fit for a school or organization that has a 1-to-1 program where participants use their own device such as mobile phones, laptops or tablets. Participants answer questions and follow along using their personal device. This is a powerful and seamless solution if internet connectivity in you classroom or conference hall in not an issue. Besides being a reliable and low-cost solution, the QVR app offers interactivity for online trainings, meetings or conferences. Using the QVR app with an online conferencing tool like GoToMeetingTM or SkypeTM, participants can connect to a live session from anywhere. Keep your online audience engaged by capturing opinions and gauging understanding with interactive polling questions. Participants follow along, answer questions and view results on their device. This solution is a great fit for companies that are on-the-go. Teams can easily stay connected and participate from anywhere. All results can be exported post-session to document understanding and participation. There is another Qwizdom app you should consider, called Qwizdom Notes+. When presenters purchase an annual license, the app is free for participants to download and install through iTunes, Windows App Store or Google Play. How is this different then the QVR response app? Qwizdom Notes+ is a polling and collaboration app designed for a local area network (LAN). It is a low-cost solution that allows students to follow along, take notes, answer questions, add and share annotations with the group. Instructors can ask collaborative questions during a live classroom presentation. For example, a participant could be asked to demonstrate how to solve a long division math problem. Using a Chromebook, iPad, tablet or other touch device, the participant could solve the problem and display his or her work to the group. This solution is best for organizations that have a private network and a 1-to-1 program. In conclusion, I hope I given you a starting point to understanding some of the advantages of both audience response and apps. I encourage you to do your research and look for the option that best fits your needs. Qwizdom has been around for more than 30 years in the education and audience response industry. We offer competitively priced systems, design with flexibility in mind. We also offer no on-going fees, free tech support and free software updates when you purchase a response set. For more information on our corporate solutions, please visit www.qwizdom.com/solutions and for our education solutions please visit www.qwizdom.com/education.